Many dentists suggest using electric toothbrush over manual brushes because they are more effective and have features that can make brushing more effective. Philips is a Netherland based company, a leader in personal care products. They have an amazing range of electric toothbrushes, with varied features. Their Electric Toothbrushes sell under the brand name Sonicare. 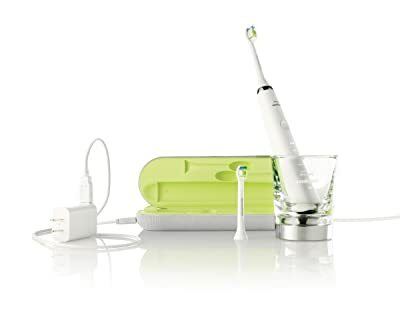 Top of the range model is DiamondClean Rechargeable Sonic toothbrush. It comes with advanced technology and amazing features which together gives you an immense satisfaction of clean teeth. Number of Modes: The patented technology of Philips drives the fluids between your teeth and along the gum line to result in a clean mouth. This model have five modes and an Illuminated display indicating the mode you are in. Clean: This mode is mainly for cleaning the plaque. It cleans even hard to reach areas and overall is much more effective compared to Manual Toothbrushes. Generally it’s suggested to use the brush for 2 min in Clean mode for good teeth hygiene. White: A 2 min whitening mode helps in removing stains from the tooth. It whitens the tooth’s 2X better than the manual toothbrush. Polish: 30 secs of usage helps to brighten and polish front teeth. Gum Care: This mode is to stimulate and massage the gums. Gum Care is important as that is one of the main cause of tooth related issues. Sensitive: Mode for sensitive teeth and gum. Speed: It uses powerful sonic technology to clean teeth. it uses 31,000 strokes per minute to clean. Manual toothbrush does those many strokes in a year. Smartimer: The timer helps you to brush for full 2 minutes. This is the recommended time you should be brushing your teeth. The beeper will go after 2 minutes. Quadpacer: This timer beeps every 30 seconds interval to make sure you covered all four quadrants of your mouth. Ergonomic design: Rubber Grip for easy handling. Glass Charger: Glass charger looks cool. Keep your handle in the glass and it will start charging using conduction technology. The dock (Glass Charger) has a rubber base so that it does not slip. The Illuminated green light is displayed when the brush is charging. The same glass can be used to rinse the mouth. However, rinse the glass first then fill fresh water to rinse. 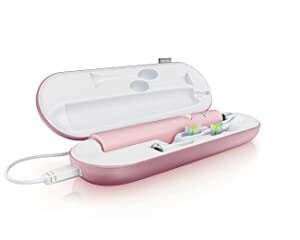 Travel Case with Charger: Travel charge case have USB port thus even without taking out the brush it can be charged using laptop or chargers. It comes very handy to carry the set anywhere. Ease of Cleaning: The brush is attached to the body by easy screw-on. You can remove the parts and wash it. However, it lacks the feature of its predecessor and do not come with Sanitizer (UV Cleaner). Battery: Brush contains a rechargeable Lithium ION battery. A fully charged battery lasts for 3 weeks. There is a low power indicator. Once the low power indicator is ON the battery lasts for around 12 uses. For the first time use, you need to charge it for 24 hours. To increase the battery life, you need to charge the battery when needed i.e. when the battery is low at least once in every 6 months. Travel Charger: It comes with USB charger and a port, to charge it anywhere. Travel Case: It comes with stylish travel case. The USB point is inbuilt in the case. You need not remove brush from the case. Directly connect USB cable to laptop or wall plug. Color Options: It comes in 3 color options. Cost of Brush: It is the high-end model, thus the price is on the higher side. If you are looking for a stylish, slim and effective model and doesn’t mind shedding some moola, DiamondClean would be a very good choice. However, if you are looking for a more budget model I would recommend Sonicare Essence or Oral-B Pro 1000. Cost of replacement Brush Head: The cost of replacing the brush head is approximately $12. The standard replacement brush heads come in 2 pack, 3 pack or 6 pack. 1 Travel case with USB Travel Charger. DiamondClean is similar to the other models such as Sonicare Flexcare Plus and Flexcare Platinum. It has five modes: Clean, White, Polish, Gum and Sensitive. The travel case and glass charger are really cool. However, it does not have UV Sanitizer like its predecessors. That carries a negative mark on it. Flexcare Plus model is very famous. If you are using it, then I do not think there is a need to switch. However, if you are a first time user or looking to anyways replace your present brush, it is a very good choice.